Only seven questions and seven short answers in this week’s mailbag because I’m out of town and don’t have much time to spare. Send your questions to RABmailbag (at) gmail (dot) com and I’ll get to as many as I can each week. Steve asks: As you have mentioned a few times, I love how Stanton pimps his homers. But I think I enjoy the “football handoff” he does with the the 3rd base coach. Is that something he started with the Yanks? Or carried over from the Marlins? Any backstory? Regardless, I enjoy it! 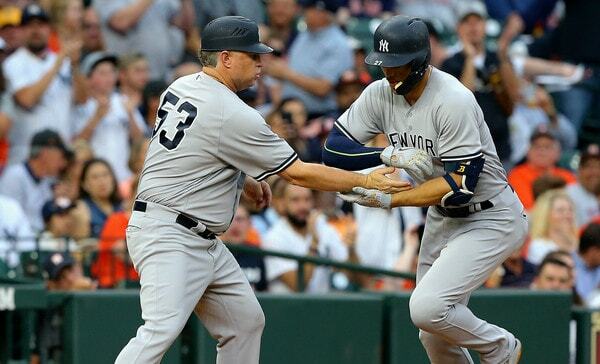 Giancarlo Stanton’s post-home run handoff with the third base coach goes back several years. Back in 2012, Joe Frisaro explained Stanton started it after an overly exuberant post-homer high-five with then-Marlins third base coach Joe Espada nearly knocked Espada’s shoulder out of its socket. He needed something a little less dangerous. “It’s like, turning the corner and catching a football. I get a little pumped up. I almost knocked his shoulder out. Now, we’re non contact,” said Stanton, who was a big time high school football player. Here’s a highlight reel. Nico asks: Why is Judge in the dugout but not Gary? If you’re Gary, aren’t you a little put off that the team has anointed Judge a leader who needs to be around the team but not you, even though you came up around the same time and are both stars? If I were Gary, I’d probably already feel like the team hangs me out to dry when the media criticizes me (for passed balls, not busting it to 1st when he was actually injured) – and this Judge thing wouldn’t help. You’re reading way too much into this. Gary Sanchez was in Tampa for a week or two so he could go through his rehab work with the team’s rehab coaches. The big league coaches have enough on their plate as it is. Sanchez rejoined the Yankees for a few days this week just to check in with everyone, and he’s going back to Tampa at some point this weekend to continue rehabbing. Aaron Judge isn’t doing much at all right. Running and throwing. That’s about it. Once Judge is ready to ramp up his rehab work and start hitting in the cage and things like that, he’ll head to Tampa as well. That’s the best place for a rehabbing player. Scott asks: Greg Bird has been injured…a lot…and not produced the way the Yanks had hoped. Do you think the Yankees will focus as much on a 1st baseman as they will say someone like Patrick Corbin or Manny Machado? Thanks! Will they? I have no idea. The Yankees really love Bird. Should they? Yes, I think so. Too many injuries and not nearly enough production when healthy. And here’s the thing, if it all clicks with Bird, what are you getting? You’re getting a platoon first baseman — I know Bird has good numbers against lefties in his big league career so far, but it’s 138 plate appearances spread across three active seasons — who’s not going to hit for a high average because he pulls the ball on the ground so much. The upside is something like .250/.400/.500 and that’s the best case scenario. I dunno. Bird’s been hurt so much and so bad against fastballs post-surgery that the chances of him reaching his ceiling are growing smaller and smaller, whatever that ceiling may be. Since Opening Day 2015, the Yankees have received a 95 wRC+ (26th in MLB) and +3.3 WAR (25th) from their first basemen. Terrible. It is time to get some production from the position. Joey asks: Do you see the Yanks bringing back Lynn or Happ next year on 1 or 2 year deals? I think the chances are pretty good they re-sign one, actually. I think the Yankees are much more likely to re-sign J.A. Happ over Lance Lynn. They were after Happ for a while and he’s a lefty with a good body of work in the AL East, and the better recent health trade record. It seems to me Happ was the guy the Yankees really wanted at the trade deadline. Lynn was the other guy they added because they wanted a second starter and he was the best the market had to offer. Happ does turn 36 in October, remember. Maybe the Yankees will hold firm at a one-year offer? Or go one year with an option? But yeah, I could definitely see them making a strong push to re-sign Happ. 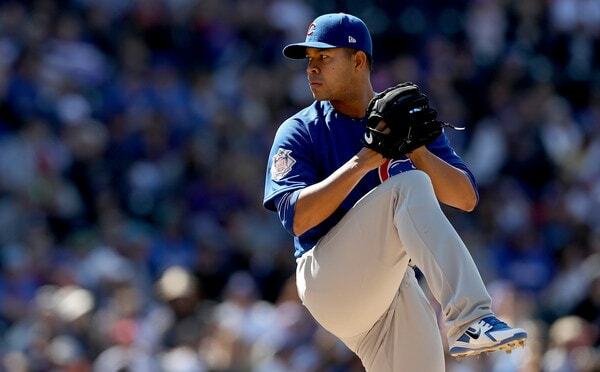 Bill asks: How about Quintana for Gray in the offseason? Both guys are struggling with their new teams and could be guys that benefit from a change of scenery, maybe yanks throw in a lower level guy to offset the extra year of control for Q? I’ve seen this idea floated around and I like it, but I can’t imagine the Cubs would do it straight up. I sure wouldn’t. Jose Quintana (4.46 ERA and 4.85 FIP) has been better than Sonny Gray (5.43 ERA and 4.33 FIP) this year and he has an extra season of team control. The Yankees would have to kick in a sweetener to make a deal happen, and it might have to be a significant sweetener. I’m a Sonny Gray fan but I have no faith in the dude turning it around at the moment. I’d bet on Quintana going forward. Josh asks: Who pitches the WC game? Not sure I have trust in Sevy. CC might not be healthy and Tanaka is too homer-prone for my liking. Lynn and Happ have looked good but are you really going to give the ball to trade-deadline pickups? If you don’t have any starters you’re confident in, does it make sense to maybe go full bullpen game? Holder, Green, Britton, Robertson, Betances, Aroldis? Rich asks: Hey Mike… chances of the Yankees taking a minor league flier on Phil Hughes? Small. Phil Hughes was released by the Padres earlier this week and the Yankees might be willing to stash him in Triple-A as a warm body. I can’t see him helping at the big league level though. Hughes didn’t mix well with Yankee Stadium when he was in his 20s and at the peak of his abilities. Now he’s 32 with two Thoracic Outlet Syndrome surgeries under his belt. Hughes has a 6.34 ERA (6.59 FIP) this year and a 5.18 ERA (5.11 FIP) in 300.2 innings since 2015. Not sure there’s anything to reclaim here. As a guy who gets innings in Triple-A to prevent the actual prospects from being overworked? Sure. I don’t think Hughes can contribute in any other capacity at this point.